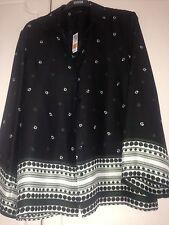 Next Ladies Blouse Long Sleeve Colour Black / White Size10. Condition is Used. Dispatched with Royal Mail 2nd Class. Petite Hana style V neck & back off shoulder shirt dress. 3/4 sleeves,machine washable. Nice pretty top from Wallis. colour is a gorgeous turquoise blue with lovely butterfly & floral design. Pull on style one button fasten back if neck, sleeveless with straight hemline. STUNNING NEXT PETITE FLORAL SHIRT BUTTERFLY AND POPPY PRINT. UNDERARM TO UNDERARM 18". Womens High to Low Ivory Beautiful Orchid Print Button Down Shirt Sze EU 34 UK 6. Used but in great condition. Rear neckline keyhole fastening. Main colour is bright red. The fabric is sheer and feels crisp to the touch. Without any stretch. Best fits UK Size 8 or Petite 10. The top is not long line and looks its best when worn tucked into a pencil skirt. ASOS Petite sky blue blouse with sheer inserts in size 6. Part of the hem has unraveled but easily fixed. STUNNING WALLACE TOP SIZE 14 PETITE 3/4 SLEEVES FLORAL. Very pretty. Condition is Used. It has a keyhole neck at the front. Gorgeous top for any occasion! This is a lovely, lightweight top by Fenn Wright Manson. The main colour is grey and it has an all over abstract floral print. It has front darts which prevent the armholes from being too big. Back length 60cm (24"). Debenhams Petite Pink Rose Floral Floaty Summer Holiday Blouse Top Size 16. From a pet and smoke free home Condition is Used. Dispatched with Royal Mail 2nd Class. 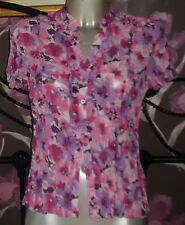 Next floral patterned blouse size 14. Condition is Used. Dispatched with Royal Mail 2nd Class. A REALLY NICE SLEEVELESS TOP IN A SIZE M (12/14)BY ZARA. HAS A VNECK ON THE BACK & A SLIGHTLY DEEPER ONE ON THE FRONT (SEE PHOTO 4)THE TOP IS MAINLY BROWN BUT THE V HAS A THICK STRIP OF CREAM & 1 OF LIME GREEN.DOESNT EVEN LOOK WORN.ITS IN EXCELLENT CONDITION. IT'S A SMART TOP YOU COULD WEAR TO WORK OR A WEDDING .APPROX MEASUREMENTS..46CMS WIDE UNDER THE ARMS,46CMS/18INCHES LONG FROM THE BOTTOM OF THE FRONT V TO HEM.I HAVE MANY ITEMS LISTED ON EBAY .IF YOU BUY ANOTHER ITEM I CAN COMBINE THE POSTAGE IF YOU LET ME KNOW. Gorgeous Wallis kaftan blouse size L which is a 16/18. Much more of an 18 as loose. Pretty print of birds and butterflies etc. Loose fit sheer fabric with a nice button down front and a tie to bottom. This is petite but is still quite long i feel. Measures 24" shoulder to hem. Very goid used condition. Smoke free clean home. Happy to combine postage costs. Please check out my other items as having a major clear out of items from my whole family. New items added daily. Thanks for looking. White high necked Zara basics top. Has a zip fastening at the back. The top has a cross over layered effect on the front (see photo) Nice top nice price. 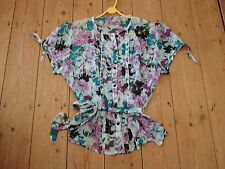 Womens Floral Blouse Size 6 From Topshop. Condition is Used. Brand new with tags brought two similar tops and this one has been at back of wardrobe unworn. Size 18 navy with bright appliqué from Marks and Spencer’s this petite top was £25. Easy to wear and able to be dressed up or down this versatile top is a great addition to a capsule wardrobe. Measures 19 inches from arm pit to arm pit and 22 inches from collar to hem. Fabric is 52% polyester and 48% cotton and suitable for machine washing. We are a pet and smoke free household. STUNNING WALLACE TOP SIZE M PETITE EU 42. 3/4 SLEEVES FRONT TIE BEIGE FLORAL. Still in very good clean condition. LOVELY SMART BLOUSE FRILL DOWN FRONT. The top is bardot off the shoulder style with elastication at the shoulders to help with the fit. Ladies lovely loose fitting blouse with green and blue mix design. Size large, petite. YOUR SIXTH SENSE LADIES CREAM FLORAL SHORT SLEEVED BLOUSE. SIZE UK 10 . Condition is Used. Dispatched with Royal Mail 2nd Class. PRE- OWNED LOVELY CREAM FLORAL EMBROIDERY BUTTON FRONT BLOUSE. UK SIZE 10. LOVELY DETAIL TO FRONT OF BLOUSE , WITH CREAM GOLD BUTTONS. COMES FROM PET FREE & SMOKE FREE HOME. Condition is Used but hardly worn. Softly rounded square neck with draped collar decorated with 2 double black beaded flowers. Made of polyester and elastane and machine washable. M&S ladies long sleeve blouse/top crossover front size 14 petite aqua exc. cond. M&S ladies long sleeve blouse/top crossover front size 14 petite in excellent condition. the blouse has an aqua background with flowers in cream and black. The cuffs fasten with a small metal button. Dispatched with Royal Mail 2nd Class. Debenhams Petite Collection Women's Pink Blouse Size 10. Elasticated Waist and Front Pleats. Condition is Used. Dispatched with Royal Mail Signed For 2nd Class. Zip fastening at the back. Label says material is 100% polyester. This top would look good on a night out but also could be worn casual. Nice top, nice starting price. George, UK size 12, black & white, crop top floral print, halter neck, petite.